This year’s Cannes Yachting Festival line-up is looking particularly strong, with several new arrivals from the world’s biggest yards. 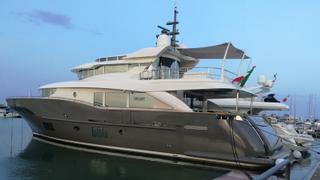 Our round-up starts with the 33.5 metre Amer 110, which was recently launched by Italian yard Permare. Notable for its quadruple 900hp IPS Volvo Penta engine set-up, this all-GRP yacht hit a top speed of 30.5 knots on her sea trials. This year’s Cannes Yachting Festival line-up is looking particularly strong, with several new arrivals from the world’s biggest yards. 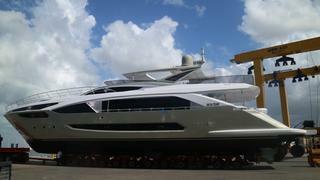 Our round-up starts with the 33.5 metre Amer 110, which was recently launched by Italian yard Permare. Notable for its quadruple 900hp IPS Volvo Penta engine set-up, this all-GRP yacht hit a top speed of 30.5 knots on her sea trials. 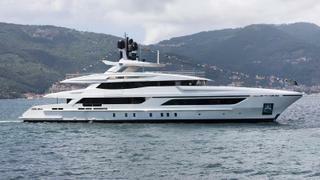 At 47.6 metres LOA, Andiamo is likely to be one of the biggest yachts on display at the 2017 Cannes Yachting Festival. 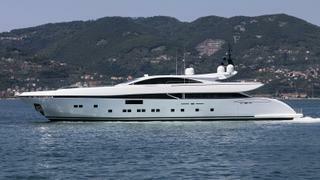 Launched by Italian yard Baglietto in June and currently undergoing sea trials, she was styled inside and out by Francesco Paszkowski. Star features include her transatlantic cruising range when cruising at 12 knots, which is made possible by twin 2,012hp MTU 12V4000 M63 diesel engines drawing on a total fuel capacity of 80,000 litres. 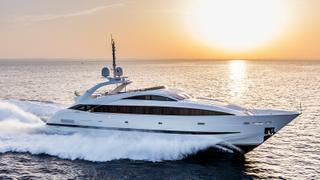 Italian yard Arcadia Yachts will be bringing the latest version of its 25.9 metres Arcadia 85 to the Cannes Yachting Festival this year. Designed for owners who want a close relationship with the sea, this all-GRP cruiser features an innovative winter garden that can be completely opened up to the elements via sliding glass windows. Another standout features is her 40 square metre solar panel array, which can deliver 4.5KW of power to the electrical system, thus boosting the eco credentials of the Arcadia 85. 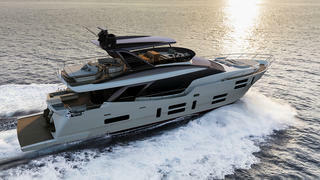 The new flagship of the Azimut range, the Grande 35 Metri stands out from the crowd with her innovative foredeck layout. The trapezoidal bow design was developed in collaboration with Stefano Righini and allows for a spa pool, sunloungers and a separate seating area. What’s more, the entire section can rise up hydraulically to allow the crew to access the storage lockers beneath. Five hulls have been sold since the Azimut Grande 35 Metri was announced at the 2016 Cannes Yachting Festival and we expect a few more will shift at this year’s show too. 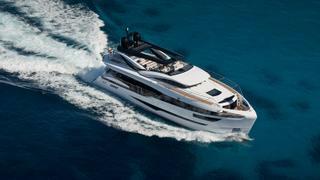 A brand new model from Italian yard Canados, the 808 Maximus is due to undertake a grand tour of the Riviera this summer before her official unveiling at the Cannes Yachting Festival in September. Styled by Marco Casali, this 24.6 metre fast cruising yacht will boast a sporty top speed of 30 knots thanks to its lightweight Kevlar/Aramat composite construction. There was a strong focus on the aft deck layout during the development of the 808 Maximus, which can be seen in the fitment of an extra-wide gangway that is wheelchair accessible, flanked by two L-shaped seating areas. Swooping exterior styling and equally dramatic 34-knot performance make Clorinda one of our stars of Cannes 2017. Launched by Palumbo Group in July, this 36.45 metre cruiser is historically significant as the first ISA yacht to be completed since the Ancona-based yard was acquired in August 2016. 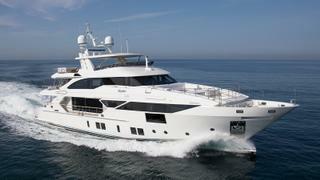 She also features an unconventional layout, with the indoor dining area situated aft of the main-deck lounge. Custom Line has revamped its popular Navetta 33 yacht and hull number one is due to get its public debut at Cannes 2017. 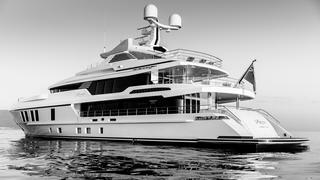 Styled inside by Ferretti Group Engineering and with exterior design by Zuccon International Project, this 33 metre tri-deck yacht boasts many premium features, such as a spa pool on the upper deck, a fold-out balcony in the saloon and a full-beam owner’s cabin on the main deck. 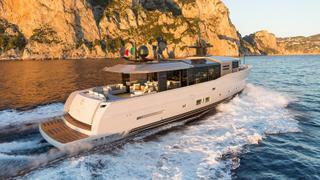 The previous version of the Navetta 33 was a massive hit — 20 hulls were launched in total — and the new generation seems set for similar success, with the first five hulls already sold. This lightweight 25.25 metre carbon fibre yacht from Italian yard Mylius is sure to turn the heads of sailing aficionados visiting this year’s Cannes show. Hull number three in the yard’s flagship Mylius 76 range, E Vai displaces just 30 tonnes and boasts a sleek flush-deck design by Alberto Simeone. Launched in April at the Italian yard, 49.9 metre Elsea marks an exciting new direction for Cantiere Cerri Navali, as she is the first yacht in the fully custom Fuoriserie line. Her sleek styling is courtesy of Studio Bacigalupo and reflects her sporty performance, with a top speed of 27 knots achieved during her recent sea trials. Key features include two saloon areas — a formal space with a dining table on the main deck and a more cosy area on the upper deck, which is ideal for hosting on-board movie nights for all ten guests. 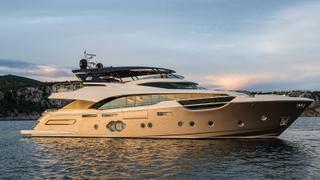 The Ferretti Group will be giving a debut to five new yachts in Cannes, including two from its signature range. 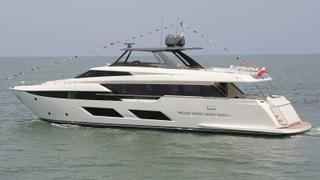 The Ferretti Yachts 920 is the larger of the two and features a raised bow design that allows for a wider main-deck master cabin. The Italian yard adds that the foredeck seating area is also the largest it has fitted to a yacht of this size, with two sofas, sunloungers and removable parasols. Propulsion comes from a pair of MTU diesel engines, with the most powerful option making a top speed of 30 knots possible. Hull number three in the Darwin 102 series of compact explorer yachts, Galego features several customisations on the standard Hydro Tec design, such as 2.18 metre headroom and an upper deck gym. 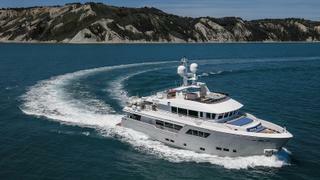 Built by Italian yard Cantiere delle Marche from a steel hull and aluminium superstructure and launched in Ancona in April, she will be getting her public debut at Cannes 2017, where visitors will hope to catch a glimpse of her warm and welcoming Pierluigi Floris interiors. Taiwan-based yard Horizon Yachts has built up a serious global appeal over recent years and this can be seen in its decision to bring hull number two of the FD85 series to Cannes this year. Launched earlier in 2017, this 26.07 metre yacht was styled by Dutch designer Cor D Rover and can accommodate up to ten guests and five crewmembers. The first in a new range of Ilumen yachts from Italian yard Dominator, Kalliente will make her public debut at the 2017 Cannes Yachting Festival. Alberto Mancini created the interior and exterior styling for this bright and airy yacht, which features a main-deck master cabin that is absolutely flooded in natural light, while a sporty top speed of 21 knots is made possible by a pair of 1,200hp MAN V8 diesel engines. 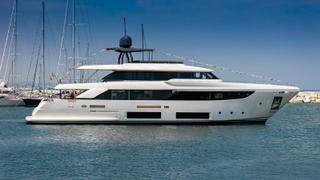 Finnish yard Nautor’s Swan will be debuting a new range at this year’s Cannes show. Lot 99 is hull number one in the 28.87 metre Swan 95 series, boasting exterior styling and naval architecture from long-time yard collaborator German Frers. Her semi-raised saloon allows for more internal headroom and better views out to sea, but a flush-deck version will also be made available for those with more sporty ambitions. Hull number two in the Filippetti Navetta 26 series, Maxima will be making her worldwide debut at Cannes 2017. Six years have passed since the launch of her sister ship Sakata and the Italian yard has been busy adding several new features including a raised pilothouse and a forward-facing dining area on the main deck, which promises great views out to sea. 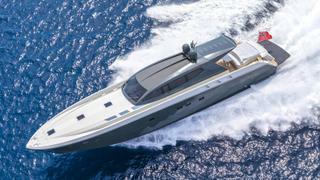 The ongoing collaboration between Italian yard Monte Carlo Yachts and designers Nuvolari Lenard has produced its seventh model, the MCY96. Hull number one, Mia will be attending this year’s Cannes Yachting Festival, where visitors will be able to admire her smooth lines, high bow and sleek profile — all hallmarks of the studio’s future classic design philosophy. The sunset sea trials are a real VIP highlight of the Cannes Yachting Festival, and with her scorching top speed of 48 knots, Mystere is sure to be the hottest invite at this year’s show. Launched by Italian yard Otam back in March as hull number four in the Millennium 80HT series, her staggering turn of pace is made possible by a twin 2,600hp MTU 16V2000 M94 diesel engine set-up twinned to Arneson surface drives. 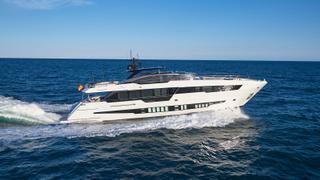 Spanish shipyard Astondoa is celebrating its 100th anniversary with the Century range, which began with the launch of the 110 Century Sophye and continues with the 30.45 metre Astondoa 100 Century yacht Ninitas. 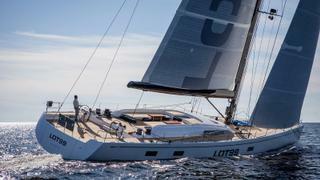 Built at the yard's Alicante HQ, this 26-knot fast cruising yacht is due to make her public debut at Cannes 2017. The towering superstructure takes the raised pilot house style to new heights, leaving acres of space for a luxurious main-deck master cabin fitted out with a décor by Italian studio Cristiano Gatto Design. It’s not all about the European yards, however, with a number of American builders making the journey across the Atlantic for the Cannes Yachting Festival. 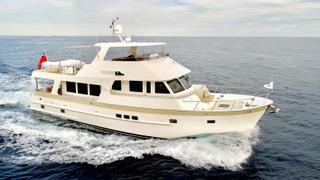 One of the most notable is Outer Reef Yachts, which is giving a European debut to the Classic 630. This 19.23 metre trawler is the epitome of a pocket superyacht, with three generous cabins and upper deck tender storage cleverly incorporated into its compact dimensions. What's more, Outer Reef can modify the design Classic 630 to suit an owner's needs, with the aft deck, saloon, galley and cockpit all customisable. The first new yacht to be launched by Turkish yard Turquoise since 2013, Razan is a 47 metre steel and aluminium cruiser from the drawing boards of British studio H2 Yacht Design. She stands out from her peers with a spacious superyacht beach club and a globe-trotting maximum cruising range of 4,200 nautical miles. Fresh from her debut season exploring the Turkish coast, Montenegro and Croatia, Razan is sure to be a head-turner at Cannes 2017. One of the most hotly anticipated new arrivals of 2017, the new series of crossover yachts from Sanlorenzo begins with the SX88. Developed in collaboration with Officina Italiana Design, this 27 metre aims to deliver the outdoor living of a flybridge yacht with the long-range capability of an explorer yacht. A highly flexible interior layout allows for up to six cabins, thanks to Sanlorenzo’s bold decision to do away with the main-deck wheelhouse. Piero Lissoni created the interior concept for hull number one, drawing on the design of New York luxury loft apartments to create an open and light atmosphere on board. 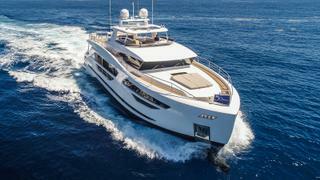 The Cannes Yachting Festival wouldn’t be complete without a big new yacht from Italian boatbuilding giant Benetti. The Fast 125 range has stolen the show at Cannes for the past two years with the debuts of Iron Man and Constance Joy, and with hull number three Skyler, the yard is hoping to complete the hat-trick. Subtly updated with clever superstructure modifications, this highly sensuous 38 metre yacht features silk carpets and a sprung floor in the dining room. 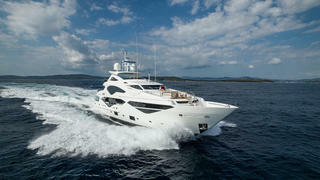 British yard Sunseeker will be giving its popular 131 Yacht a Cannes debut this year. First introduced at the 2016 London Boat Show, this 40.05 metre series has proved to be hugely popular with the eighth and ninth hulls sold at the 2017 London Boat Show. Key features include accommodation for ten guests in five cabins, as well as a large tender garage than can house a six metre tender and a pair of Jet Skis. 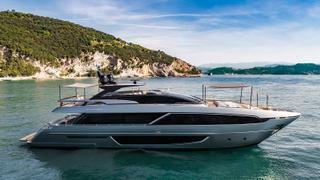 Riva’s sleek dayboat, the Rivale 56 is sure to turn heads at Cannes, but superyacht aficionados will also be keen to step on board the new Riva 100 Corsaro. Hull number one Bernardette got her premiere in 2016 at the Hong Kong boat show, and the second hull, Wild One, will give the range its European debut. Her effortlessly cool styling is by Officina Italiana Design with the arrow-shaped bow giving her a distinctive profile.